STEP BY STEP GUID FOR..!!
! 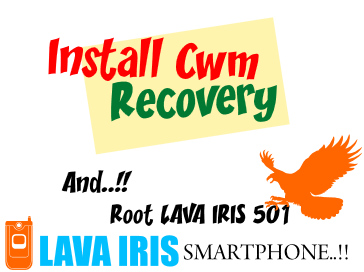 !HOW TO INSTALL CWM RECOVERY AND ROOT (LAVA IRIS 501)!! FIRST DOWNLOAD LAVA IRIS 501 "ALL IN ONE" FILE FROM MY WEBSITE"
STEP:3 CREATE A FOLDER ON DESKTOP...!!! STEP:4 COPY (recovery.img) & (MT6577scatter file) IN RECOVERY FOLDER. !! !A POPUP WINDOW WILL DISPLAY!!! STEP:9 CLICK YES AND CONNECT YOUR MOBILE IN PC VIA DATA CABLE AND WAIT FOR PROCESS.!!!!...DONE...!!! !..IN YOUR LAVA IRIS 501..!
! !FOR ROOT LAVA IRIS 501! !